Enjoy the Rain! Protect your home today when April Showers come your way. Enjoy 25% off Gutter Helmet. Call for a FREE on- site estimate today! Casement windows allow for better ventilation in your home. Casement-style windows are a popular choice for many homeowners because of their elegant look and unobstructed views. 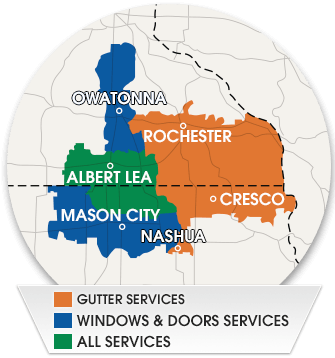 Among all the replacement window companies in Southeast MN & Northern IA, Home Solutions Midwest stands out for our dedication to quality materials and excellent customer service. We offer a full selection of casement windows from Renewal by Andersen. These high-quality replacement windows will protect and adorn your house for many years. To schedule a free in-home design consultation and estimate, give us a call at 1-844-665-0388 today. Casement windows are a great fit for many homes. These tall windows have hinges on one side to allow unobstructed opening and ventilation from top to bottom. They give your home a fresh, modern look while maximizing energy efficiency and lowering your heating and cooling bills. Casement windows are among the most popular replacement windows that we install. Custom casement windows are a great way to renew the appearance of your home without the expenses of a full renovation. At Home Solutions Midwest, we have 35 years of experience in installing the best possible windows for every home. We can help you choose replacement windows to suit your exact needs. Whether you’re fixing storm damage or updating the look of your house, we offer casement windows that will give you a classic profile and modern energy efficiency. Would you like to know more about the unique advantages of casement windows? Get in touch with our specialists today for a free in-home estimate with no obligation. Call us at 1-844-665-0388 to schedule yours in Owatonna, Winona, Faribault, Austin, Northfield, Albert Lea, Farmington or any surrounding area in Southeast MN & Northern IA.